Chlorella purity is of paramount importance when you choose a Chlorella’s brand. Purity of the Chlorella is the most important thing that you have to look when choosing your Chlorella. It matters because Chlorella has a limited capacity in its cell to absorb toxics such as heavy metals, dioxins, PCBs. The purest the Chlorella is, the higher this capacity. As a matter of facts, Chlorella’s efficiency regarding the detoxifying process lies into how pure the Chlorella is. 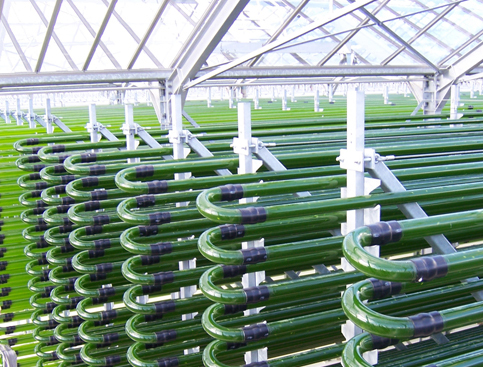 Today, the most secure production process is the Photobioreactor (Chlorella grows into glass tubes – patented process used in Germany) since the alga is in a completely protected environment but still use the sun as a natural vector to grow. This is where the Chlorella Echlorial is produced. Chlorella is often cultivated in outdoor ponds where its purity is jeopardized by the external environment (air, dust, pollution, insects, birds’ excrement, etc). Consequently the Chlorella produced is less “pure” and its very capacity to absorb heavy metals and other toxics drastically decreases. The purest the Chlorella is, the more efficient it is in our organism. This is why Chlorella’s purity is of such importance. All the precious elements found in the Chlorella: Chlorophyll, Vitamin B12, Omega 3, Amino acids… are fragile healthy entities and must be preserved in order for the Chlorella to render efficient results in our organism. Cultivated in this unique plant in Germany, the Chlorella Echlorial is probably the purest Chlorella on the market, and consequently the healthiest one.